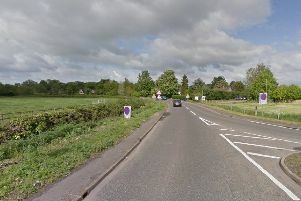 The air ambulance is at the scene of a serious collision which has closed the A605 between Coates and the A141. Details are still coming in, but police say there are reports of three vehicles involved, a dropside lorry, a tractor and a car. Ambulance crews have also confirmed land ambulance units and the Magpas air ambulance are in attendance. Two people have been injured, one has been airlifted to hospital and one person has been taken to hospital by the East of England Ambulance Service. Motorists are asked to avoid the area until further notice.